Taken from somewhere in the Atacama Desert, Chile, on April 7th, 2017. The Atacama Desert is one of the most surreal, entrancing landscapes I’ve visited. It’s incredibly stark and dry, and in some areas there is literally zero plant life. In many ways the folded earth and giant salt pans vividly remind me of Death Valley in California. But just when it starts to feel familiar the Atacama will throw you for a loop. First off is the elevation. Instead of being low and hot like Death Valley, the Atacama is high and cold, with elevations ranging from 7,000 to 19,000 feet. There are brightly-colored flamingos that inhabit mineral-rich lakes that are toxic to humans. And of course, there are the volcanoes. A chain of enormous volcanoes runs north-south, roughly along the Chile-Bolivia border. Each of them is snow-capped, hulking, and surrounded by a landscape that is inhospitable to all but the hardiest plants and animals. One of the mightiest of these is Miñiques, which towers above the landscape at nearly 19,400′. It’s an enormous complex of peaks, craters, lava domes and lakes that is visible for miles in any direction. While out exploring the landscape south of the town of San Pedro de Atacama I spent the afternoon wandering around the attraction of Las Piedras Rojas (the Red Rocks). But getting on toward sunset I spied lenticular clouds forming on the lee side of the Miñiques volcano and knew it could make for an interesting photo. Gunning the rental sedan down the rough and bumpy road I drove to a vantage point where I could get the volcano, the clouds, the moon, and the scrubby landscape all in one frame. As the sun dropped below the horizon it lit up the lenticulars a gorgeous shade of fuchsia and I was able to capture this photo. 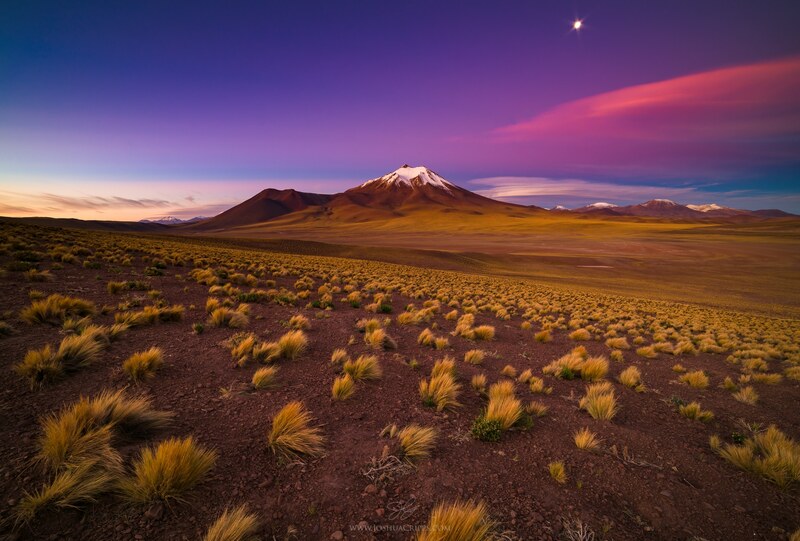 The photo of Miniques volcano in the Atacama desert in Chile is spectacular. Although I’ve not been there, I lived in southern Peru, in the city of Arequipa, for two years while volunteering with the Peace Corps. El Misti is the dominant volcano there with mountain ranges surrounding the city on the other two sides of the valley. I must admit that I’ve not seen as wonderful a view of El Misti in Arequipa as your photo with lenticular clouds at sunset in Chile. My time in Arequipa brought me views of El Misti that were interesting in the aspect that the city (showing the outlying squatters’ barriadas) seemed to crawl closer and closer to the faldas (skirts) of the volcano); there is the snow season, we would look up and see that overnight the faldas had been formed because of the snow there. Thanks for lovely photos of exciting places. Hi Josh! I’m going to travel to Uyuni salt flats to San Pedro. I want to try to produce some nice photos but I can’t find an ideal tour. Did you take any tours or you did it by yourself? In Uyuni I booked a tour. I wouldn’t worry too much about finding the right one in advance. You should be able to find lots of tour agencies once you get to Uyuni or even La Paz. In San Pedro there are also TONS of tour agencies. I simply talked to a few until I found one that felt good to me and was also recommended by other travelers. In San Pedro I had a rental car (rented from Calama) and drove around the area by myself. It was pretty easy to get around!